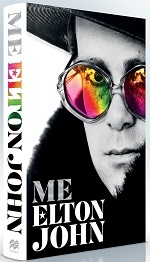 Elton John yesterday revealed the cover of his forthcoming autobiography, Me (Macmillan, 25 October). The rock legend appears with a dummy of the book on a brief video, available on YouTube. A pinned tweet on his Twitter account features another brief video, in which he introduces the book at "my favourite bookshop", John Sandoe in Chelsea. Macmillan is promising that the autobiography, written with journalist Alexis Petridis, will be a "no holds barred" account of John's life and work. Publisher Jeremy Trevathan said: "As a book, it just delivers more than any of us could ever have hoped it would. It's honest, irreverent, moving, revealing and, for the reader, it feels like Elton is sitting there, looking you in the eye, laughing and talking to you directly - and it's such a pleasure to be in his company. I absolutely guarantee that this will be THE memoir of the decade." A global marketing campaign for Me is in preparation. In the UK, John will take part in an in-conversation at the Hammersmith Apollo in November, with a signing at Waterstones' Piccadilly to follow. Anthony Forbes Watson, Macmillan MD, and Holt US president Stephen Rubin signed the book through Andrew Wylie.